First Line: His life wasn't worth spit in a hard rain. When his fiancée is found murdered, the prime suspect is the Burned Man, a hideously scarred Iraqi war veteran. However, railroad police Special Agent Sydney Rose Parnell is convinced that there's more to this apparent crime of passion than meets the eye. Perhaps it's because she and her K-9 partner, Clyde, are also veterans of Iraq, but Parnell can't help digging deeper in the investigation. 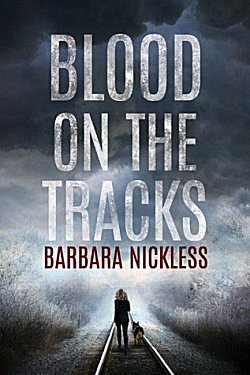 The further Parnell and Clyde look into the crime, the further they descend into the underground world of a savage gang of rail riders until they uncover a conspiracy and a series of shocking crimes. Not only do these two have to protect themselves from a brutal Denver winter, but they also have to protect themselves from killers who do not wish to be exposed. If there's one thing this hard-hitting, compelling mystery brought home to me once more, it's the fact that we ask too much of our two- and four-legged soldiers. We always have, and we have always given them too little in return. Even though I did roll my eyes a little at a few things in the book (the best time to track a killer out in the middle of nowhere is during the Storm of the Century; whodunit was a bit easy to piece together; and why does a female character have to have a love interest? ), I was still blown away by this fast-paced, visceral story, and that has almost everything to do with the main character. I immediately fell under the spell of Sydney Rose Parnell's voice. She may have inherited her fiancé's dog, and she may think "something was broken inside of Clyde," but she is the one who is truly broken. Each chapter begins with an excerpt from her private journals or college classwork, and these passages hammer home the damage her time in Iraq has done. Parnell was part of a team none of us want to think much about: Mortuary Affairs. As a member of that team, it was her responsibility to find every bit of a deceased soldier that she could in order to piece the body back together. If a part could not be found, it had to be "shaded out" on the proper form. Each time Parnell touches her heart with her hand and makes a dead soldier whole in her mind, it's a mind punch for the reader, and Parnell's world is brought into sharper focus. Parnell's K-9 partner, Clyde, doesn't have quite as much to do in this book as working dogs have in similar books I've read, but I think his contribution will grow (and what he does do is choice). There are some unanswered questions about Iraq that should come to light in the next book in the series, and I'm looking forward to reading Dead Stop. I want to learn more railroad and hobo lore, and I definitely want to learn more about Sydney Rose Parnell. She's the type of character to get under a reader's skin and refuse to leave. I like that. It sounds like a really interesting look at those two main characters, Cathy. And that in itself can make a book memorable. And you're right: we ask a lot of, and give not enough to, our soldiers. I had noticed that you've read several 'working dog' books lately. That is a popular theme for sure. This one sounds good, though sad. I'll keep it in mind, but I'm steering away from really sad for a bit. The story kept me so engaged that it really didn't occur to me that it was sad. I think I enjoy working dog mysteries so much because I had such a wonderful rapport with the dogs that were part of my pack.